If you are a regular reader, or you follow me on any social media you will know that I'm a bit of a Beauty bay junkie. Today I thought I would share ten products/brands that you should definitely check out on the site. This was super hard to narrow down, I really think the products here are the creme de la creme. So without further ado lets get into the post. Starting off with brushes the Morphe 332 is actually the only thing I have tried from the brand but I am absolutely obsessed with it. It's the perfect slightly fluffy crease brush for my eye shape and size. I think if you have a smaller or more hooded eye shape this might not work as well for you however if you have pretty big eyes this is just an amazing brush to put colour in the crease and blend in a targeted way. The brush quality is actually much better than I expected and it washes really nicely. The other brush I wanted to mention is the Zoeva 317 winged liner brush, I love so many Zoeva products however I have to say this is definitely my favourite. It is the best brow brush ever and is one I reach for every single day. Moving onto palettes I had to mention my Coloured Raine Queen of hearts palette, this one was definitely my favourite palette of 2017. The shades are so stunning and just so pleasant to work with. Although the deep purple doesn't swatch well it works beautifully on the lid and blends like a dream. The metallics are more like a foiled shadow and are perhaps my favourite shadow formula ever. The Juvias place Nubian palette is perfect if you love a warm toned palette. Both of these were actually mentioned in my top five palettes post so definitely check that out if you want to know more. The final palette I wanted to mention today is the Blank canvas cosmetics Master palette 1. 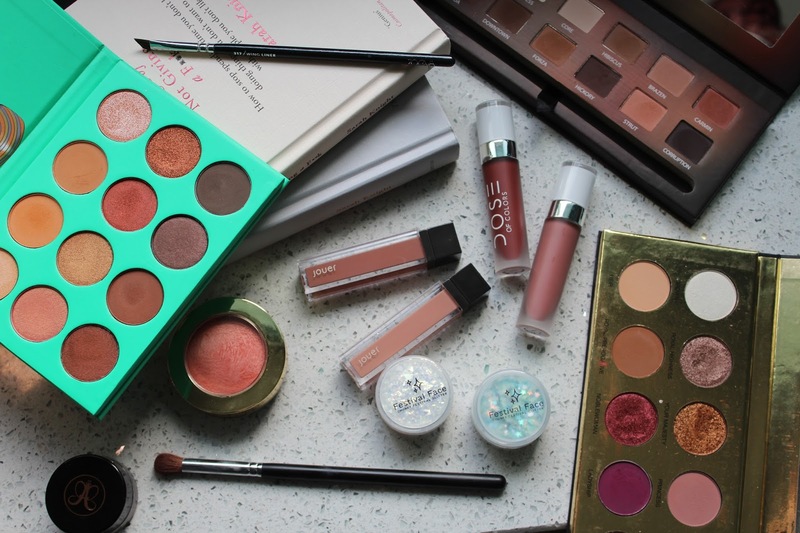 I feel like this palette gets no way near enough credit as it is just a really basic neutral palette however these shades are just so lovely to work with and I think it is the perfect basic palette in anyones collection. Milani Luminoso is such a hyped product and one that really deserves it in my opinion, it is a stunning rose shade with a golden sheen which just makes the skin look so beautiful and glowy. It isn't too pigmented either making it very hard to go over the top with it. I honestly think everyone should have this shade in their collection as it us just such a beautiful shade. The Festival face glitters are a bit of a random addition to this post however I wanted to mention them for the more creative types! These come in such a huge range of sizes, shapes and colours. One of the ones I have is actually little UV moons and stars which look so cute both on the lids and on the face. The final non lip product today is my Anastasia Dip brow. You can get this elsewhere and the Anastasia website do now ship to the UK however I picked up mine off Beauty bay when it was very hard to get elsewhere. I love this stuff and if you are a regular reader you will already know that as it is basically the only brow product I use. Finally we have two different liquid lips. 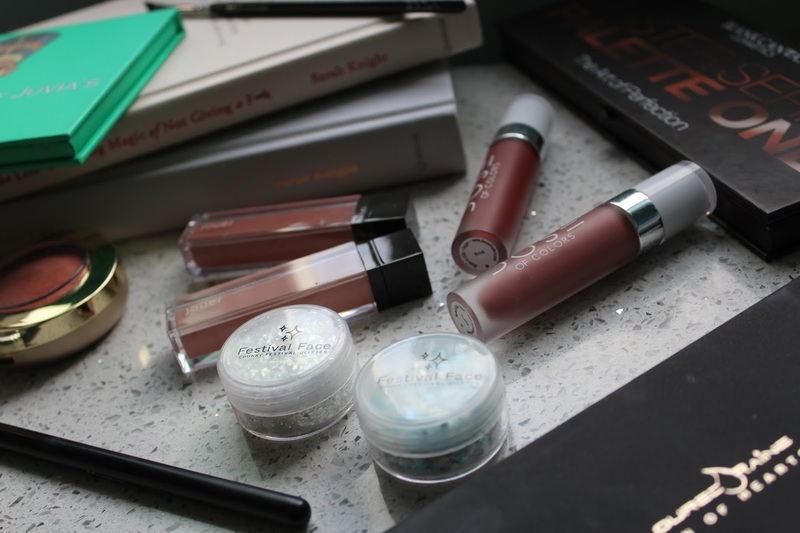 It was so hard for me to not include my Jeffree star Liquid lips in this however I do tend to purchase those off Beautylish now as they tend to get the new collections faster than Beauty bay so I thought I would mention two different brands. The first being Jouer which I have only recently dipped my toe into their waters and I am so impressed. Their liquid lips are super matte yet don't feel uncomfortable on the lips. I also wanted to mention the Dose of colours liquid lips which are possibly the most beautiful matte liquid lips I own. They set down to the most beautiful almost velvet finish and are ones I reach for all the time. So that's it for today's post, I'd love to know what products from Beauty bay you feel people need in their collections. I LOVE my morphe palette but haven't actually tried any of the brushes. They're not too badly priced either so I'll have to give them a go! I’m still gutted that Beauty Bay stopped stocking Natasha Denona! I’m such a beauty bay addict! They have so much great stuff!! There’s lots here I’ve not tried yet - Dose of colours lippies are high on my wish list!